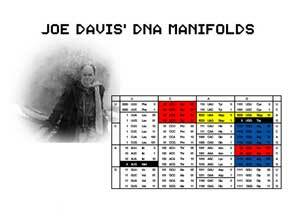 DNA Manfifolds are a discovery Joe Davis and use the intrinsic possibilites of the genetic code to store additional information within actual functioning DNA of an organism, but without changing the genes (of this organism). The 'central dogma' of molucular biology states the information flow from DNA to RNA to amino acids to protein. DNA can be seen as the storage of genetic information, RNA as its transport mechanism, amino acids are the building blocks of proteins, and protein are the results; the things, that do the actual work. DNA, the famous double helix, is made of a long string of 4 bases: adenine (A), guanine (G), cytosine (C) and thymine (T). 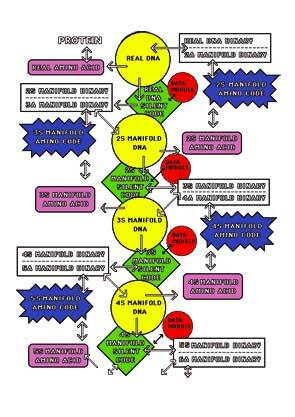 The mapping of the 64 base-tripletts to only 20 amino acids is known as the 'genetic code' and was only fully understood in the late 60ies. In most cases there are two or more base-tripletts, that code for one amino acid. For example, the base-tripletts CUU, CUC, CUA and CUG will all produce the amino acids Leucine. A change in the last digit will have no effect, as Leucine will be produced in any way. This is called Silent Mutation. 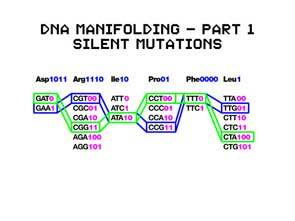 First, it uses of this Silent Mutations by assigning a binary value to each base-triplett. The information can be encoded, only by changing the base-tripletts, the resulting amino acid will not change. Secondly, binary values are also assigned to each amino acid. This 'amino code' can be utilised to produce another, 'hypothetical' DNA sequence, by convering the joint amino code sequence using the following key: 00 -> U, 01 -> C, 10 -> A, 11 -> T.
The same procedure can be applied again to the hypothetical sequences over and over again. Biopresence is collaborating with Joe Davis to incorporate human DNA within the DNA of a tree, but without affecting the genes of the resulting tree. © 2007 Biopresence Ltd. (UK) All Rights reserved.